He is always in the stands, cheering with the intensity of a true Milan fan. And since Berlusconi’s current term as Italy’s Prime Minister, he is largely the voice and face of AC Milan. But what he is truly known for is his genius in the transfer market. The man who grabbed Kevin Prince Boateng on loan from Genoa in the second half of August, then brought in Ibrahimovic and Robinho in the waning days of the summer mercato for incredibly low prices is both revered and feared in the football world. Consider the January transfer market this year, which left other teams in complete awe and was one of the biggest factors in Milan pulling through its massive injury crisis and winning the Scudetto. Not only was he able to offload Ronaldinho and his massive salary, he brought in Cassano, Van Bommel, Emanuelson, and Vilá for mere pennies and short-term contracts. So far this mercato, it being May 31st, he has signed Taye Taiwo, Philip Mexes, and bought out Boateng from Genoa as well as Paloschi, Amelia, Strasser, Zigoni, and Oduamadi, all fully-owned Milan players now, all purchased at low prices. As if that wasn’t genius enough, he somehow talked Genoa into taking Sokratis back. He created the new policy that older players will only be offered 1 year contract extensions, and has signed many of them under this plan already. 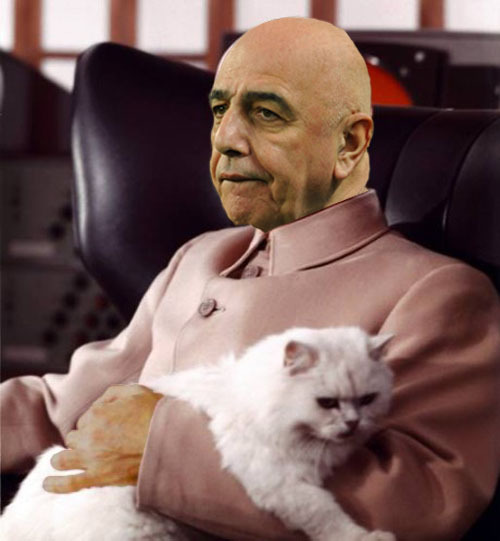 In fact, thus far, considering contract negotiations and departures, Galliani has saved €14 million thus far. Did I mention it’s only May 31st? 1) Prayer. We all saw him in the stands praying from the 70th minute on in the Roma match. But the question is, who does he pray to? He sold Kaká, who belongs to Jesus, so it is unlikely he is praying to a Christian God. And considering his association with Berlusconi, it is unlikely that any righteous entity would hear his prayers. But I didn’t know that Satan heard prayers, so this explanation is unlikely. 2) Mind control. Perhaps the “Dr.” in “Dr. Galliani” is a doctorate in hypnotism? That might explain how he kept Preziosi at the €7 million buyout price for Boateng when Preziosi was clearly wanting to raise the price. Still, it’s hard to imagine that these other club owners wouldn’t have wised up to this after all of these years and taken some kind of precautionary measures when dealing with old Golden Tie. 3) Evil genius. Like Ernst Stavro Blofeld, head of SPECTRE in the James Bond novels and movies, Galliani has a lot of the characteristics of an evil genius. He is a man of mystery, and yet a well-known icon. He surrounds himself with lesser minds (Berlusconi) and lets them do his dirty work (when was the last time Galliani was implicated in a legal battle?) He presents a credible business front, and yet accomplishes the impossible behind closed doors. Is it bribery? Blackmail? Extortion? Physical threats? We may never know. But this explanation seems the most plausible. One thing is for sure, whatever methods he uses, I’m glad that I am on his side. I cannot imagine sitting across a table from him having a transfer discussion. Plus, we get all of the great players for cut-rate prices. Does that make me evil, too? Who am I fooling? I am a Diavola through and through. Bring it on Dr. Evil. The transfer market has just begun. This post brought to you by the musical inspiration of Rammstein.